Due to a building schedule conflict. The FINAL WINTER SESSION on FEB. 20, 2016 will be RESCHEDULED. If you have already signed up for this session you have received an email with a new time and/or date. Please reply to Coach Frontier and confirm which date and time you will attend. MADISON THROWS CLUB apologizes for this inconvenience. Just in case you missed it...CONGRATS to Winona State's Kaitlyn Long (SO.) on her National Record in the weight throw! This might need updating...there are a lot of meets left in the season and the next, and oh the next after that! Keep working hard! Madison Throws Club is so proud of you! Check out more info about Winona State Womens Track and Field here. As Madison Throws Club enters it's 15th year and the calendar flips from 2015 to 2016, I thought it would be appropriate to look back on some of the amazing things MTC athletes accomplished in 2015. So proud of these throwers and all that they have done. 10. 5 Madison Throws Club athletes from the class of 2016 sign with D1 colleges to continue their throwing careers at the NCAA level. We can't wait to see what these seniors do this year and beyond! Holly Houston (Madison Memorial '16) - Montana, Sam Noennig (Hartford 16') - Arizona State, Kris Lindow (Ashwaubenon '16) - Dayton, Mikaela Grant (Jefferson '16) - Central Michigan and Landon Ellingson (Jefferson '16) - Stanford. Stay tuned a 6th could be signing soon. 9. Chloe Eckstein (Reedsville '15) won the WIAA D3 State Discus title. Chloe's 4 years of hard work allow her to break through in a big way at her final state meet. Chloe claims the 24th WIAA State SHOT PUT or DISCUS championship by a Madison Throws Club athlete. 8. Theron Baumann (Monona Grove '12) competed in his first season at UW-Whitewater. He broke the UW-W Shot Put record both indoors 57' 0.75" and outdoors 57'11". He was an NCAA D3 All-American in the Shot Put indoors (8th) and outdoors (3rd) while finishing 13th in the discus. Excited to see what Theron will do as a follow up in 2016. 7. Sam Noennig won the 2015 WIAA D1 Shot Put title. Sam lead a 1-2-3 MTC sweep of the D1 Shot with Erin Dunning (Ashwaubenon '17) and Kris Lindow finishing 2nd and 3rd respectively. This is the 4th time MTC athletes have swept the top 3 spots in a division, D1 Boys Discus in 2011 and 2012, Girls Discus in 2013. While MTC has had boys sweep the throwing events (see #3), Sam become the first MTC girl to double in the same year (see #6). 6. Sam Noennig defended her 2014 WIAA D1 State Discus title. Sam P.R.d at the biggest meet of the year for the second consecutive year. Her throw of 161'6" was the 2nd best girls discus performance from any division in WIAA State Meet history. In an ultra competitive field including Josie Schaefer, Holly Houston and others every inch was needed. 5. Josie Schaefer (Baraboo '17) Samantha Noennig and Holly Houston each had monster discus throws that moved them up/on the Top 50 of all time list. Josie's throw of 169' 4" is the 2nd best throw in Wisconsin prep history. Sam's throw of 161'6" ranks 6th all-time. Holly's throw of 150'1" ranks 16th. The 3 girls competed at the same meet on 3 occasions in 2015, each winning once. Amazing to see 3 of the all-time best train and compete with each other. 4. Jason Zahn (Grafton '12) competing in his Junior season at NCAA D2 throwing powerhouse ASHLAND UNIVERSITY finished runner-up at the D2 NCAA National meet in the Discus. The former WIAA state champ improved to 185'8" with the 2k implement. Jason enters his senior looking to make more noise in the discus and shot put as well. 3. Tucker Wedig (Belmont '15) completes a double sweep defending both his 2014 WIAA D3 State Shot Put and Discus titles successfully. With 4 State Championships, Tucker is the most decorated MTC athlete at the State Meet. 2. 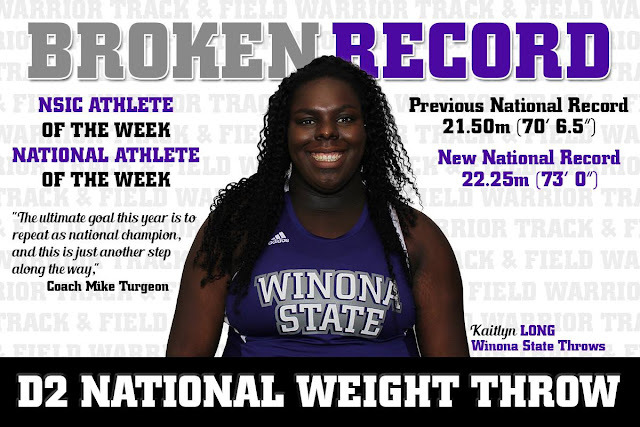 Kaitlyn Long (Monona Grove '14) competing in her first year at NCAA D2 Winona State wins the 2015 NCAA NATIONAL TITLE in the WEIGHT THROW. In her first year training in the event Kaitlyn's 68'9" P.R. is the 6th farthest throw in D2 History. Can't wait to see what happens over the next 3 years! 1. Samantha Noennig and Josie Schaefer are chosen for the 2 girls discus spots for TEAM USA at the 2015 World Youth Championships in Cali, Columbia. Josie and Sam finished 1st and 2nd respectively at the US Youth Championships in July to qualify for the team, based on their strong resumes both were selected to the team. Josie finished 7th while Sam finished 20th in the world in the 17 and under competition.